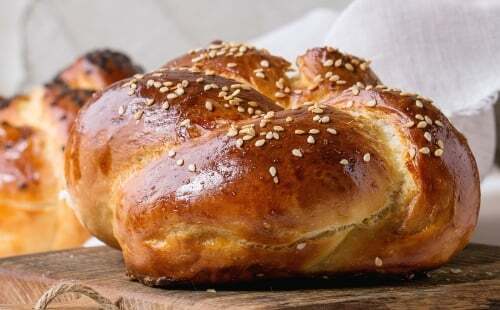 Round challah is a traditional Rosh Hashanah treat. Bread made from the five species of grains identified by our sages (wheat, barley, rye, spelt or oat) require the blessing "Hamotzi". In order to be considered bread, the liquid ingredient has to be primarily water and it has to be baked. Dough that uses more oil or fruit juice than water (like pastries), or dough that is fried or cooked (like pasta) is not regarded as "bread." Baruch atah A-donay, Elo-heinu Melech Ha’Olam, asher kideshanu bemitzvotav vetzivanu al netilat yadayim. Blessed are You L-rd our G‑d King of the universe Who has sanctified us with his commandments and commanded us on the washing of the hands. Then dry your hands thoroughly. Baruch atah A-donay, Elo-heinu Melech Ha’Olam Hamotzi lechem min haaretz. Blessed are You, L-rd our G‑d, King of the Universe, Who brings forth bread from the earth. When eating a meal that includes bread, begin your meal by washing, making the "Hamotzi" blessing, and eating a piece of bread. The Hamotzi blessing will "cover" everything you eat as part of the meal (except for dessert and wine). "Grace After Meals," recited after the meal, will cover everything you've eaten. What’s Up with the Hand-Washing? In order to be required to make a blessing, any amount works. Even a tiny morsel needs to be preceded by a blessing. However, many mitzvot have minimums. To make an after blessing, one needs to eat the amount of an olive (about one ounce). Some mitzvot require up to 100cc. Liquid ones generally require drinking a reviit (approximately 3.5 ounces).